Would You Name a Working Dog after a Breafast Cereal? ﻿﻿﻿﻿Whether you name your dog "AJ" or"Zyta" or one of the thousands of dog names in between, naming your dog can be a real challenge. 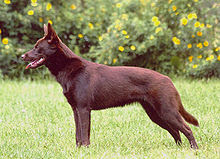 Just ask my father who allowed his then 3 year old grand-daughter to name his new kelpie pup. Lets just say I think "Coco Pops" had his work cut out convincing the other working dogs on the farm to take him seriously! If you're dog has a funny, unusual or particulary descriptive name, we'd love to hear about it.